Starting out, let’s take a look at the Outcast Starter Set. The Outcasts are a diverse and scattered people doing their damnedest to survive in the wastes by any means necessary. Whether it is through scavenging useful parts from those fallen before them, throwing their fellow wilderness folk in chains, putting down stakes in a frontier town, or even living a low tech nomadic lifestyle – they will survive. The 500 point force found in this box can be used as part of any Outcast Force, and is a great way to start the faction! The first thing you’d want to pick up after the Faction Starter is the Outcast Faction Deck. Living off the scraps of the world, Scavengers piece together a life out of junk and salvage. The Slavers of Chains Barrow trade in fear and peddle those unfortunate enough to fall into their shackles. The Salt Flat Nomads eschew technology to live off the poison steppes, bringing deadly beasts to battle alongside their warriors. The Brute Court of Freeton is a community of genetically altered laborers with a focus on fighting for their musclebound democracy. All of the stats needed to play the Outcast Factions in Dark Age can be found within this 54 card deck. With all those figures, you’re gonna need someone to be in charge. So, you might consider getting the Outcast Brute Court of Freeton Leadership Box. The independent Brutes of Freeton, led by the highly respected Judge Remington Books and his force of fierce Brute Marshalls, is a collection of Outcasts that pride themselves on their freedom, their tenacity, and their willingness to endure all hardships or conflicts in order to further their community’s goals. As we mentioned above, Outcasts aren’t the only faction getting stuff, of course. And some figures can cross over between factions. Such as what comes in the Misfits and Monsters Box. There are some hunting folk on Samaria that don’t really work with the official Bounty Hunter guilds in Trent or Talen. Instead they work for those willing to pay their prices, of which are rarely something as base as money. These are the Bounty Hunters from elsewhere, aliens, spacefarers, and oddities. Skars, the warped monstrosity made by alien invaders. Suzy Belle, a space pirate officer looking to settle old scores against her captain, often finding the mutant alien beast Wroth nearby, crushing their foes with his bare fists. We continue along with Skarrd releases with the new Skarrd Cult of Metamorphosis Box. Evolving through the art of grafting, the Cult of Metamorphosis takes the Skarrd mentality of transformation to a higher level. 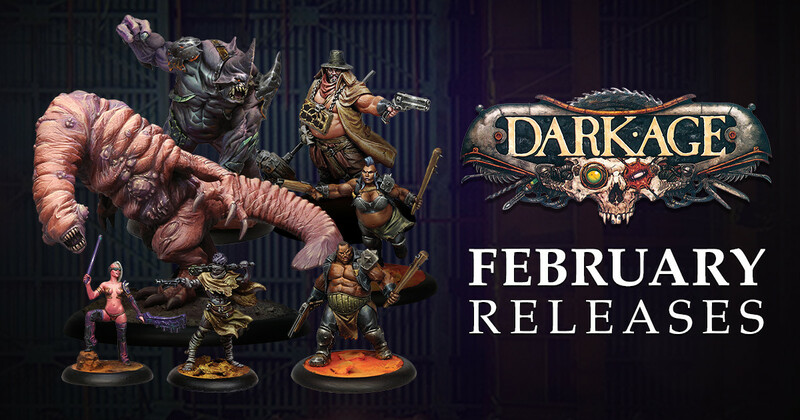 Led by the insidious Father Johann and his loyal servants, the Cult is a collection of monsters of flesh and metal always eager to slaughter anyone getting in the way of their goals for conquest. Skarrd has another release in the form of the Harpy Unit Box. Many Grafters have dedicated themselves to improving the Harpy design. C.O.R.E. circuitry has made the power flow between a Harpy’s nervous system and her wings more efficient, allowing the wings to be made longer and more beast-like. These improved wings have increased the Harpies’ range. They can catch wind currents and soar for tens of kilometers, spying on locations they never could have reached before. We finish off this month’s releases with the return of the Brood Spawn Howler, in its new box. One of the Broodmere’s greatest and singularly largest monstrosities ever to crash through the swampy undergrowth, the Howler is an enormous killing machine capable of healing the most egregious of wounds in seconds while tearing the enemy into bite-sized chunks. The Howler’s deafening sonic attacks can be heard for miles around – spreading terror to all those who know that keening howl! And there you have it. We hope they show our love for you all appropriately. Now get out there and tear your opponent’s heart out!